Zacman stands for Zippered Accessory Case and cord MANager, and it does it mighty well. Let’s face it, most electronics geeks have way too many cords, chargers, adapters, USB sticks, media cards, card readers, batteries… Well, you surely get the idea. Before now, keeping them organized was usually a hit-or-miss proposition. Most knapsacks and briefcases with lots of pockets and pouches just never seemed to have enough. Now, thanks to Alan Jones, inventor of the Zacman organizer, there’s a more elegant solution than that old ziplock baggie you are probably using. The Zacman organizer looks like a zippered portfolio that might hold your medium-sized Daytimer, but when you open it, the similarity ends. 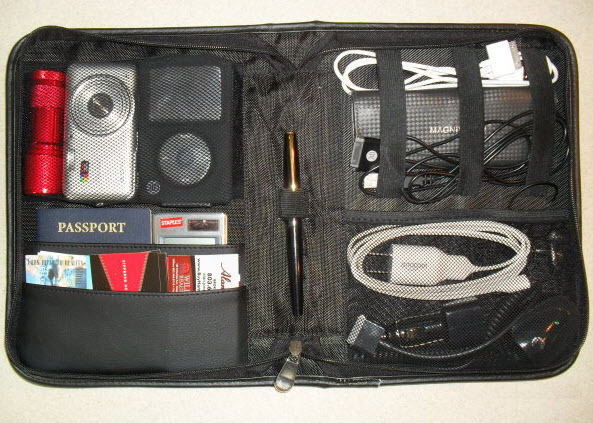 On the inside of the left panel is a mesh pouch – large enough for an iPod, digital camera and a cell phone. Below it are two slots for notebooks, passports, or receipts, with two lower slots for business or credit cards. A pen loop is found on the hinged center panel. Top right is a series of three parallel elastic straps that can hog tie all your miscellaneous cables. Lower right is another mesh pocket large enough to carry multiple chargers and all your other loose gadgets. When the case is closed, there’s even an external sleeve just right for holding my Sony eBook reader or travel documents. Check out their website at GoZacman.com or watch this video from the 2011 Travel Goods show where Zacman makes a cameo appearance.